Everyone wants to be in great shape, but it’s difficult to get motivated for a run when faced with the oppressive heat of summer or a crowded, uncomfortable gym. 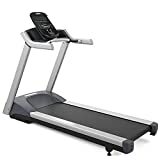 The Precor 9.23 Treadmill with Ground Effects, which can be found on Amazon for around $1,800 with free shipping, will provide a fantastic workout from the air conditioned comfort of your own home. This fitness club quality treadmill by Precor, which entered the market in 2004, has a 3.0 horsepower continuous duty motor and maintenance-free belt which are backed up by a five-year warranty. The sturdy frame and welds have a lifetime guarantee. Its 6 preset programs and patented impact control give your routine a more natural feel by duplicating the hills and level surfaces of a typical jogging trail without the additional strain on your joints. The patented Ground Effects Impact Control Technology provides shock absorption to cushion your joints from the impact at the front of your stride while still providing a firm structure for return at the back of your stride. The short handlebars, which give you more room at the sides for natural movement, include an easy-to-use heart rate monitor so you can keep your heart rate at the optimum level for improved fitness. There are six programs that can be tailored to your workout preference. The weight loss setting is designed to keep your heart rate at the optimum level for efficient fat burning. Hill climb can be adjusted up to a 15% incline to provide an intense run or walk that is sure to be a challenge . Fun run is a great way to just blow off some steam to your favorite music. 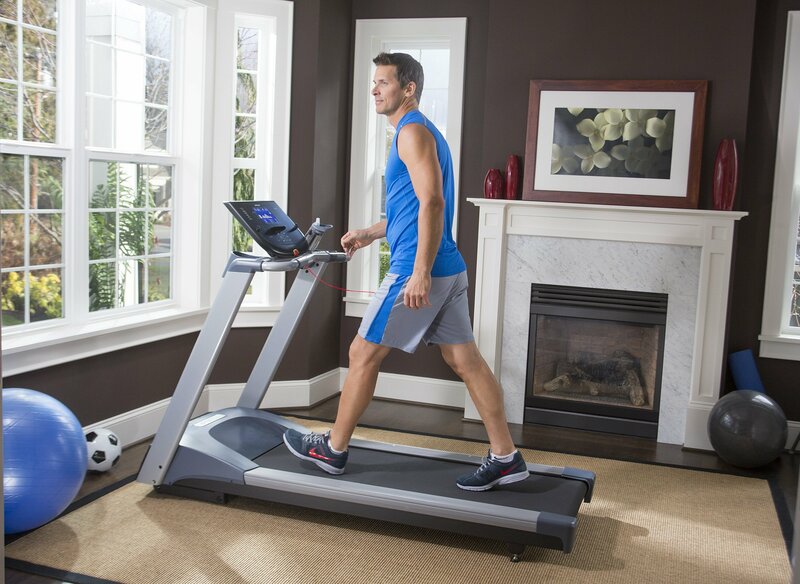 This treadmill is smaller than others in its class, making it perfect for compact living spaces. It’s dimensions are 81” L x 31” W x 54” H, 227 lbs. Stride support technology adjusts the belt speed to match the variations in your stride. The speed settings adjust between 0.5 to 12 miles per hour in 0.5 mile per hour increments. Its sturdy, fully welded steel frame is powder coated to deter rust and guaranteed to last a lifetime. An integrated reading rack holds books or magazines to allow multitasking while you workout, and accessories holder with two water bottle holders lets you stay hydrated without missing a step. The magnetic safety clip gently and safely turns the machine off in case of stumbling or a sudden fall. This treadmill can support a walking weight of up to 500 pounds and a running weight of up to 350 pounds. There is no need for a 20 amp outlet with this device. It works with a standard U.S. 15 amp outlet. A 57” by 20” belt provides plenty of room for a running stride. The control panel calculates speed, distance and even calories burned when optional weight is entered. The quiet motor won’t interfere with television watching or music listening. The control panel cannot be tilted down for easy viewing of a lower tv stand. It doesn’t support the use of an external chest-strap heart rate monitor. Both hands must be placed on the handlebars to measure heart rate. This machine is fairly heavy, at about 250 pounds and will require some assembly before use. Set-up generally takes from 30 minutes to an hour. There is no way to save user profiles. The users weight, age and preferences must be re-entered each time it’s used. This is a no-frills machine. There is no fan to keep you cool, no Ipod or MP3 support and the programs need to be manually reset with each use. No side rails option for those who need extra support. Overall, this is an excellent option for a home gym for those who don’t care about the extra bells and whistles that come with more expensive treadmills. If all you want is a fat burning workout or a good cardio machine, this is a very sturdy, dependable option for the home user that is built to run smoothly for years. The lack of side rails will generally not be missed unless a user is greatly in need of extra support while walking. While users cannot use a chest strap heart rate monitor, the built-in monitor is very easy to use, and ease to read as well with the high-contrast display. The muted brown color will blend naturally with any decor and the quiet hum of the motor will not interfere with television watching or phone conversation, which suits it for use in any room of the house. The positives far outweigh the few negatives of this machine, making it an ideal choice for users who want a fitness club-quality machine at an affordable price.